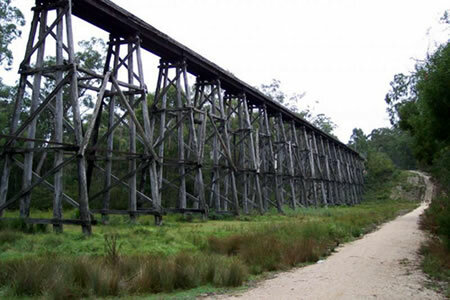 About 4.5 km west of Nowa Nowa is the spectacular Stony Creek Trestle Bridge, built in the early 1900s and measuring 276m long and 19m high. Due to its poor condition the bridge itself is fenced off, and trail users must travel down and up the steep slopes of the Stony Creek valley to reach the far side. A carpark, toilet and picnic facilities are available at this location. Nowa Nowa is located on the Princes Highway between Lakes Entrance & Orbost. Tall eucalypts stand guard as you drive into this small village. History, art and nature all converge in this one small place. The fresh waters of Boggy Creek and the tidal waters of Lake Tyers meet here. In fact this is a meeting place of sorts. In the past its history was of logging. Now artists have made it their home. Visit studios and galleries when signs invite you in. The pleasant walking tracks lead you to water or bush locales. Trek to the original rail trestle bridge built in 1914 by car or by foot. The bridge doesn't involve much exploring. You actually 'topside' the bridge via a fence and a danger sign. It's located east of Lakes Entrance and just west of Nowa Nowa. The trestle bridge is the largest wooden trestle bridge in the southern hemisphere. Follow the signs off the main highway. Worth the look if you are going by.